The cashew tree originally hails from Brazil and was traded throughout India, Mozambique and Portugal in the 16th century. Its tropical beginnings cause the tree to damage easily in temperatures less than 50 degrees Fahrenheit. You can grow a cashew tree indoors with the proper care and pruning. The trees produce a nut along with a cashew apple. The apple can be used in wines, dried fruit mixes and syrups. Cashews should not be hulled or shelled by home growers. Much like its distant relative, poison sumac, the cashew nut shell has oils that can blister and irritate the skin. Home growers should send the nuts off to be processed or just use the cashew apples from the tree. 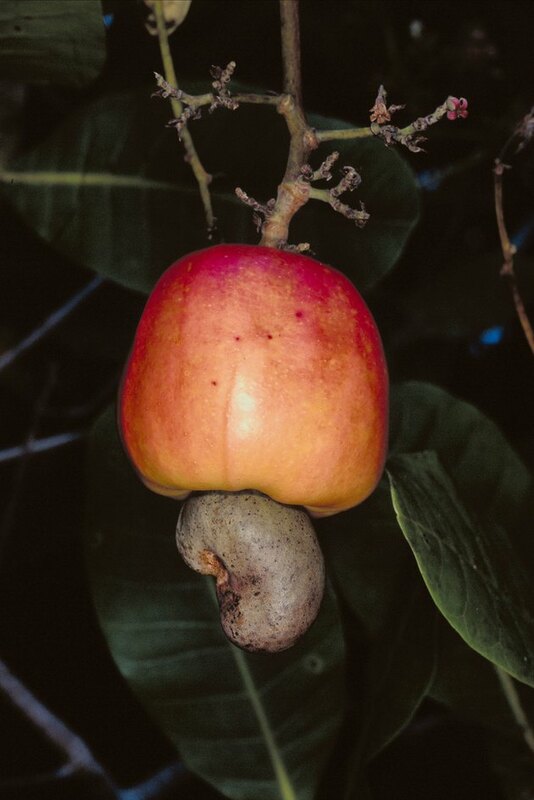 Cashew trees produce an apple which is known as a "pseudofruit." Purchase a large flower pot. You will need a 10- or 20-gallon pot. Find one that fits on a rolling tray so you can move the tree inside your home. Fill the pot 75 percent full with potting soil. Use a coarse soil that is mixed with sand. Create a hole in the middle of the soil with your hand or with a trowel. Remove the tree from the burlap. Break up the root ball with a trowel. You want to loosen the ends of the roots so they can stretch out in the new pot. Place the tree in the pot with the roots resting in the hollowed-out space you made in Step 2. Fill the rest of the pot with soil. Water the plant. Place the tree in a location indoors that receives full sunlight. The tree will need lots of light in order to survive. In the summer, keep the plant clear of cool air-conditioning vents. Keep the plant moist for the first two weeks. Water the plant a minimum of once a week after the first two weeks. Fertilize the tree with a nitrogen fertilizer in the spring and the fall after the tree is older than one year. Apply the fertilizer per the directions on the packaging. Prune your tree to keep it a manageable height and width. Trim the tree during the dormant stage. Trimming yearly will help mold the shape and size of the tree.